The total recorded landings for the area in 1993 were up 14.5% compared to 1990; reaching 3.8 million t. Of this increase, 25% can be attributed to the rise in reported landings of skipjack and yellowfin tuna by predominantly distant-water fishing nations. The main fisheries in Area 51 are: Bombay duck, catfish, croakers, emperos, jacks, pompanos, carangids, sardine, anchovies, clupeoids, tuna and tuna-like species, mackerel (chub and Indian), sharks, shrimps, and cephalopods. The landings of bony fishes not identified were 661,551 tons in 1993. The reported landings for Area 57 in 1993 totalled 3.4 million t, an increase of 22.5% compared to the 1990 figure. The main fisheries in Area 57 are: shads, catfish, ponyfishes, croakers, mullets, carangids, sardines, anchovies, tuna and tuna-like species, mackerel, sharks, prawns, shrimps, lobsters, cockles, and cephalopods. The landings of bony fishes not identified were 1,461,219 tons in 1993. A 32% rise in invertebrate landings accounted for 27% of the total increase between 1990 and 1992, while reported landings of fish increased by about 14%. The 56% rise in penaeid shrimp landings (due to both a good fishing season for banana prawn and increased aquaculture production, primarily by India and Bangladesh) accounted for half of the total improvement in invertebrate landings. Established by Resolution 2/48 adopted by the FAO Council at its Forty-eighth Session in June 1967 under Article VI(1) of the FAO Constitution. IOFC's area of competence is the Indian Ocean and adjacent seas excluding the Antarctic area. This area coincides with FAO Statistical Areas 51 and 57 (Map 15). The Commission covers all living marine resources. With the establishment of the Indian Ocean Tuna Commission, the future activities of IOFC will be substantially reduced. Species other than tuna in the Indian Ocean are geographically localized and may be managed by smaller fishery bodies at sub-regional levels. Membership of IOFC is open to all Member Nations and Associate Members of FAO. The present members of IOFC are: Australia, Bahrain, Bangladesh, Comoros, Cuba, Djibouti, Egypt, Ethiopia, France, Greece, India, Indonesia, Iran (Islamic Rep. of), Iraq, Israel, Japan, Jordan, Kenya, Korea (Rep. of) Kuwait, Madagascar, Malaysia, Maldives, Mauritius, Mozambique, Myanmar, Netherlands, Norway, Oman, Pakistan, Portugal, Qatar, Saudi Arabia (Kingdom of), Seychelles, Somalia, Spain, Sri Lanka, Sudan, Sweden, Tanzania, Thailand, United Arab Emirates, UK, USA and Viet Nam. The objectives of IOFC are to promote, assist and coordinate national programmes over the entire field of fishery development and conservation; to promote research and development activities in the area through international sources, in particular through international aid programmes; and to examine management problems, with special emphasis on the management of offshore resources. IOFC does not have regulatory powers. With the establishment of IOTC, the future role of IOFC will have to be considered by its members. 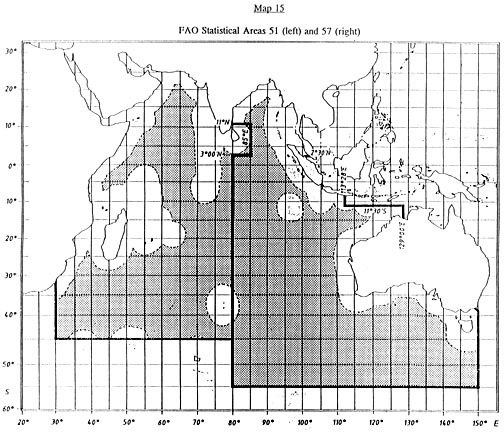 The three remaining subsidiary bodies of the Commission, i.e., Committee for the Development and Management of the Fisheries Resources of the Gulfs, Committee for the Development and Management of Fisheries in the Southwest Indian Ocean, and Committee for the Development and Management of Fisheries in the Bay of Bengal, are well placed to manage other fishery resources of the Indian Ocean at sub-regional levels. They would need a proper mandate to do so while some minor adjustments to their geographical coverage would ensure that major fishing areas of the Indian Ocean are covered by them. Established by an Agreement drawn up at Rome under Article XIV of the FAO Constitution and was approved by the FAO Conference at its Twenty-seventh Session and adopted by the Council at its Hundred and Fifth Session in November 1993. The Agreement entered into force upon the receipt of the tenth instrument of acceptance by the Director-General of the FAO, from Republic of Korea on 27 March 1996. The area of competence of the Commission is defined as the Indian Ocean and adjacent seas, north of the Antarctic convergence, in so far as it is necessary to cover such seas for the purpose of conserving and managing stocks that migrate into or out of the Indian Ocean. This area coincides exactly with the FAO Statistical Areas 51 and 57 (Map 16). The species covered by the Convention are as follows: yellowfin tuna, skipjack tuna, bigeye tuna, albacore, Southern bluefin tuna, longtail tuna, kawakawa, frigate tuna, bullet tuna, narrow-barred Spanish mackerel, Indo-Pacific king mackerel, Indo-Pacific blue marlin, black marlin, striped marlin, Indo-Pacific sailfish, and swordfish. The Convention is open for acceptance by Members and Associate Members of FAO that are (i) coastal States or Associate Members situated wholly or partly within the area; (ii) States responsible for the international relations of territories situated wholly or partly within the area covered by the Agreement; (iii) States or Associate Members whose vessels engage in fishing in the area of stocks covered by the Agreement; and (iv) regional economic integration organizations of which any State has transferred competence over matters covered by the Agreement. The Commission may, by a two-third majority of its members, admit other States which are Members of the United Nations or of any of its Specialized Agencies or the International Atomic Energy Agency provided that they are coastal States situated wholly or partly within the area or States whose vessels engage in fishing in the area for stocks covered by the Agreement. The main objectives of the Agreement are to promote cooperation among members with a view to ensuring through appropriate management, the conservation and optimum utilization of stocks as well as to encourage sustainable development of fisheries based on them. The Commission may be a two-third majority of the Members present and voting adopt conservation and management measures binding on its Members. Such regulatory measures are subject to objection procedure. Established by the Western Indian Ocean Tuna Organization Convention, signed at Mahé, Seychelles, on 19 June 1991 and entered into force in 1994. The area of competence of the Organization as described in Annex II of the Convention starts along 11oN latitude from the Eastern coast of India and through the following coordinates: 11oN latitude to 85oE longitude and 3oN latitude to 85oE longitude and 3oN latitude to 80oE longitude and 45oS latitude to 80oE longitude and 45oS latitude to 30oE longitude and then proceed along meridian 30oE to the coast of Africa. This area coincides with the FAO Statistical Area 51. The species covered by the Convention are as follows: yellowfin tuna, skipjack tuna, bigeye tuna, albacore tuna, southern bluefin tuna, longtail tuna, frigate tuna, bullet tuna, kawakawa, narrow-barred Spanish mackerel, Indo-Pacific king mackerel, Indo-Pacific blue marlin, black marlin, striped marlin, Indo-Pacific sailfish, and swordfish. The membership of the Organization is open to the funding States (Comoros, India, Kenya, Madagascar, Maldives, Mauritius, Mozambique, Seychelles, Sri Lanka, and Tanzania). Any independent coastal State bordering the Western Indian Ocean whose territory is situated principally in the Western Indian Ocean region may also be admitted by unanimous approval of the parties to the Convention. The present members of WIOTO are Seychelles, Mauritius, Comoros and India. The Organization's objectives are (a) harmonization of policies with respect to fisheries; (b) relations with distant water fishing nations; (c) fisheries surveillance and enforcement; (d) fisheries development; and (e) access to exclusive economic zones of members. There are no provisions in the Convention for establishing regulatory measures in the area covered by the Organization. The First Ministerial Meeting of WIOTO was held in August 1994. Established (as Indo-Pacific Fisheries Council) by an Agreement adopted at Baguio, Philippines, on 26 February 1948 under Article XIV of the FAO Constitution. The Agreement entered into force on 9 November 1948 and has been amended in 1952, 1955, 1958, 1961, 1977 and 1993. 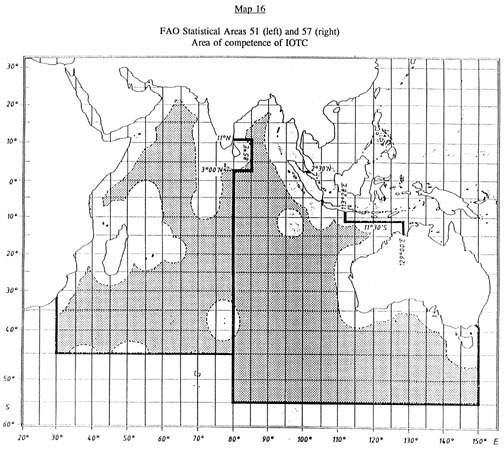 The 1976 amendment changed the title from Indo-Pacific Fisheries Council to Indo-Pacific Fishery Commission (IPFC). The 1993 amendments included the change of the title to Asia-Pacific Fishery Commission. The area of competence of the Commission is referred to as Asia-Pacific area. There is no precise definition of this area by lines of longitude and latitude. 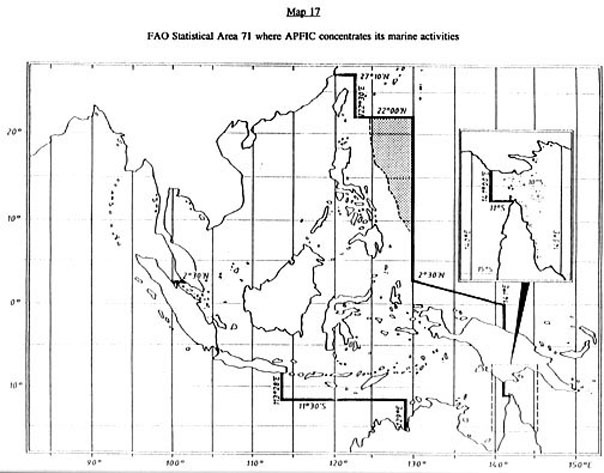 The APFIC Committee on Marine Fisheries (COMAF) is responsible for the management of Asia-Pacific area with priority on marine fishery resources in the South China Sea and adjacent waters (Map 17). The Commission covers all living marine resources as well as living inland aquatic resources. APFIC Aquaculture and Inland Fisheries Committee established in 1993 is responsible for the management and development of aquaculture and inland fisheries of Asia-Pacific area. Membership of the Commission is open to Member Nations and Associate Members of FAO. Non-member States of FAO which are Members of the United Nations, or any of its Specialized Agencies or the International Atomic Energy Agency may be admitted as members by a two-thirds majority of the Commission's membership. The present members of APFIC are: Australia, Bangladesh, Cambodia, China (People's Republic of), France, India, Indonesia, Japan, Korea (Republic of), Malaysia, Myanmar (Union of), Nepal, New Zealand, Pakistan, Philippines, Sri Lanka, Thailand, United Kingdom, United States of America, and Viet Nam. The main objectives of APFIC are to promote the full and proper utilization of living aquatic resources by the development and management of fishing and culture operations and by the development of related processing and marketing activities in conformity with the objectives of its members. The Commission has a broad mandate (Article IV) to formulate and recommend measures in respect of conservation and management of the resources in the Asia-Pacific area. It does not have regulatory powers.